Welcome to Casa Vacanze San Regolo, a lovely, enchanted place, deep in the green of nature where you will enjoy and relax youself. A place where spend a time that you’ll never forget. 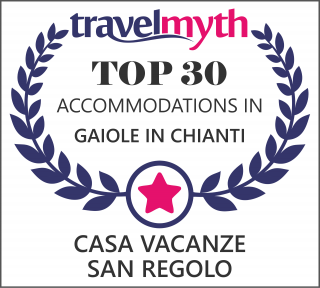 Cottages are situated in San Regolo (on Gaiole in Chiante County). They rise up on green hills where is produced the remarkable Chianti wine (DOP), just near the ancient and suggestive Brolio Castle.Thanks to their location, surrounded by the countryside, you will deeply enjoy nature but also easly reach beautiful art cities as Siena, Florence and Arezzo. Here, you will escape everyday stress and finally enjoy your deserved peaceful rest while having a great time relaxing yourself in our swimming pool, looking at the sunset. 7 enchanting cottage in rustic style, carefully decorated. Everything that we offer inside and outside the cottages. For reservations, information and avability, please contact us.